In 1953 Southern Rhodesia, self governing since 1923, entered into a federation with Northern Rhodesia and Nyasaland both of which were directly ruled by the British Colonial Office in London: The Federation of Rhodesia and Nyasaland; sometimes known as the Central African Federation.. This was a period which started with great hope and ended amid much acrimony just ten years later after Britain changed its mind. Nevertheless it was a period of economic expansion well epitomised by the construction of Livingstone House on Jameson Avenue in Salisbury, the capital city of the Federation. Livingstone House rising into the sky above, Jameson Avenue in Salisbury. The two key architects of the Federation were Sir Godfrey Huggins (later Lord Malvern), long time Prime Minister of Southern Rhodesia, and Sir Roy Welensky who had moved North of the Zambezi where he became the leading politician of Northern Rhodesia. Both actually sought amalgamation of Northern and Southern Rhodesia as an independent Dominion, similar to New Zealand, under the common name of Rhodesia. Britain rejected amalgamation but agreed to a federal arrangement provided however that the British protectorate of Nyasaland was included. Despite much misgiving on the part of the Rhodesias, and indeed many of Nyasaland’s native population, Britain insisted on her inclusion. With hindsight, and arguably even with foresight, federation was not a good idea as it lead to self governing Southern Rhodesia becoming bound up with two politically far less developed colonies ruled from London. Whereas there was a good chance in the early fifties that Southern Rhodesia might be granted full Dominion status, this was far less likely when linked with the less advanced Northern colonies. The Federation had a multi-racial parliament elected on an equal basis by a multi-racial electorate but only a few years later, following the Suez debacle and local sabre rattling by a few self-appointed and impatient African Nationalists, Britain had a change of mind and in 1963 broke up the Federation. Nyasaland was granted independence as Malawi and Northern Rhodesia became Zambia. Neither state had any history or experience of self rule. 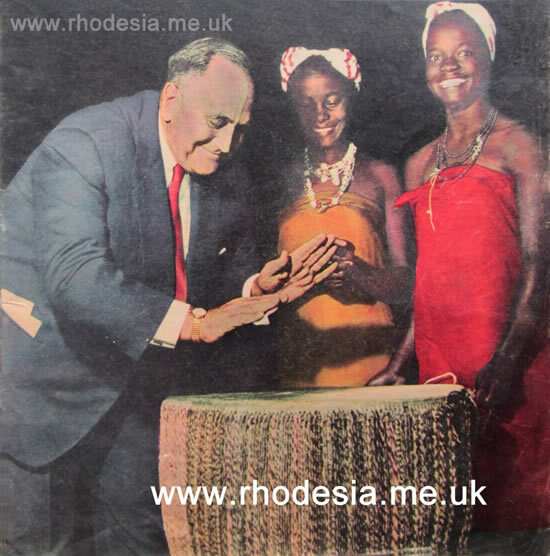 Sir Roy Welensky, Federal Prime Minister, enjoys himself trying a big drum under the watchful eyes of two happy African women. Southern Rhodesia, now alone, dropped its geographical prefix and adopted the name Rhodesia. After more than 40 years of exemplary parliamentary self government she now sought her own independence to which she considered herself more than entitled. The Rhodesian government consulted the people: a conference of Chiefs and Headmen* gave clear support on behalf of the traditional tribesmen and a referendum of the multi-racial electorate gave a similar result. Britain, seeking to rule from 5 000 miles away, had different ideas about governing from those of Southern Rhodesia where responsible government was vital to people who actually had to live together with the decisions they made. Britain rejected the 1961 constitution, which she herself had just foisted on Southern Rhodesia, as a basis for independence and after several years of abortive negotiations Rhodesia felt compelled to follow the example of the USA and many former South American colonies. She assumed her independence on 11th November 1965 by declaration of her own democratically elected government. 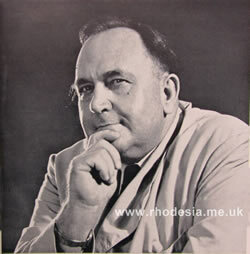 * Critics of Rhodesia, especially in Britain, and including British Prime Minister, Harold Wilson, often alleged that consulting Rhodesia’s traditional chiefs and headmen held no validity as they were “in the pay of the Rhodesian government”. The hypocrisy of this argument will be realised when it is appreciated that the upper house of the British Parliament, the House of Lords, even today more than 50 years later and well into the 21st century still consists entirely of hereditary and appointed members not one of whom is elected and all of whom are “in the pay of the British government”! 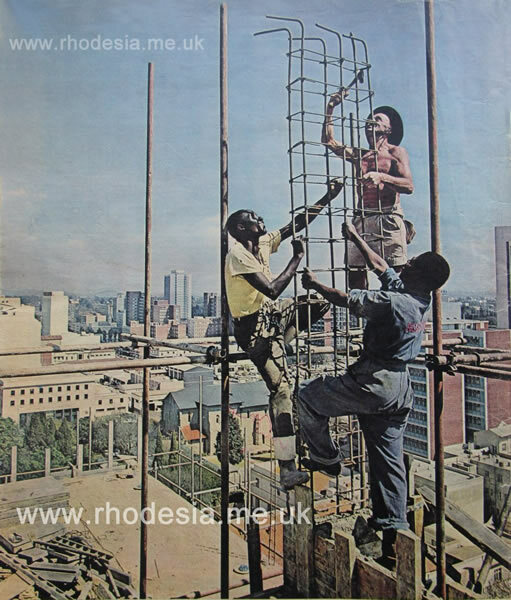 The sky is the limit for all – under Rhodesia’s sound system of government. Another Salisbury building rises up with Livingstone House in the distance. 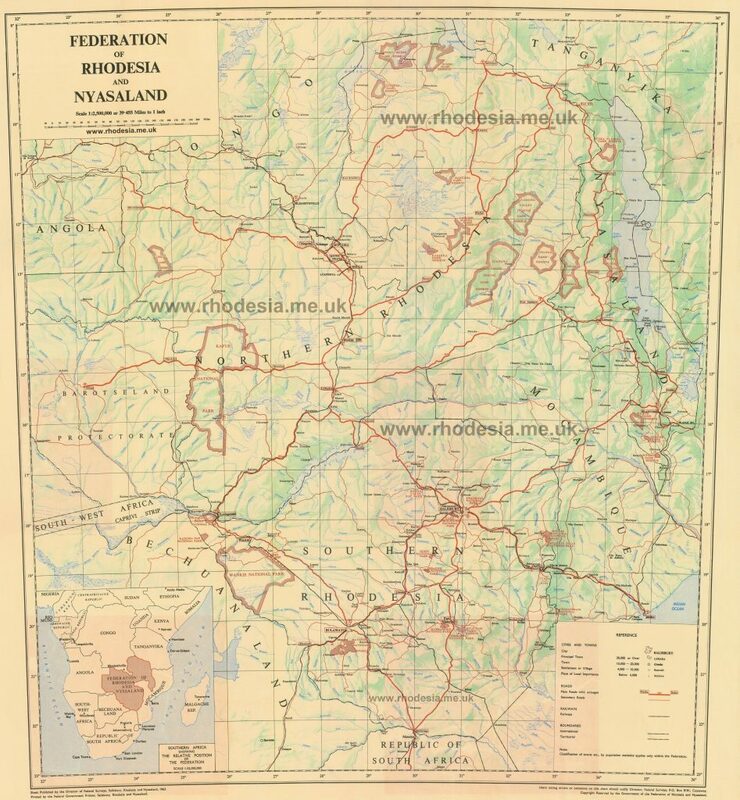 In 1962 the Federal Prime Minister, Sir Roy Welensky, was fighting to preserve the Federation of Rhodesia and Nyasaland – although by then it was likely that Nyasaland would be allowed to secede. Whilst awaiting the outcome of deliberations in Britain, which was now planning its complete demise, he gave a very illuminating speech in Johannesburg, several passages of which were in fact quite prophetic and far sighted. The speech is reproduced in full below. Not surprisingly it makes a very good defence of Rhodesia’s case! What is now usually known as The United Nations (UN) was, in former times, commonly known as the United Nations Organisation or UNO. Macleod was the British Minister for Commonwealth Affairs. U.N.I.P. refers to the African nationalist party in Northern Rhodesia. The following is the text of an address given to the Witwatersrand Branch of the South African Institute of International Affairs on 2nd November, 1962 by Sir Roy Welensky, Prime Minister of the Federation of Rhodesia and Nyasaland. Mr. Chairman, Ministers, Ladies and Gentlemen. May I start by thanking you for inviting me to Johannesburg to address this meeting. I find my visits to South Africa all too few; I greatly enjoy them, and it is an especial privilege to address so distinguished an audience as this tonight. Mr. Chairman, I am sure you will expect me to confine my speech largely to the Federation, but I want also to refer to developments, including some within the British Commonwealth, which have had a direct bearing on our affairs in recent times. I will take as my starting point the meeting of Commonwealth Prime Ministers of March, 1961, when, owing to the attitude of a group of countries, South Africa decided to withdraw from the Commonwealth. What happened then is too well known to need recapitulation; but it must be remembered that the force which operated at that time is the same force which has now turned its attention more directly towards the Federation – Pan Africanism on this Continent and the Afro-Asian bloc, its sponsor, at the United Nations. By this I do not mean that we did not claim its attention before March, 1961, nor do I imply that South Africa has ceased to be a target of Pan-Africanism. Pan-Africanism intends that Africa shall be governed by black men and black men only, come what may, and its leaders have boundless ambition in that direction, and from the inception of the Federation in 1953 we have stood in its way, because of its purely racial concept and practice. Our non-racial approach not: only thwarts their ambition, but embarrasses them as well. South Africa remains the ultimate target, of course, but the leaders of Pan-Africanism have had to change their strategy towards this country, and also to some extent towards the Portuguese provinces in Africa, and I believe that they now consider it necessary first to break up the Federation, to gain control of as many of the fragments as possible, and thereafter to set about our neighbours to the South, East and West once more. They believe that they must first crack us to get at you, and they are busy trying to do this. May I now make it absolutely clear that I intend to draw no comparison whatsoever between the policy you follow here in South Africa and the policy we follow in the Federation. Each has its virtues and each has its defects, but it is my business to discuss only the policy of my, own country. However, I can say this about South Africa’s chosen way of life, as a statement of fact which I use to give emphasis to a point I wish to make; your policy is so clearly divorced from the thinking of the Afro-Asians and their Pan-African wards on this Continent that the issues about South Africa, especially in the debates of the United Nations Organisation, are clear cut. Ours are not. Firstly, we are not yet fully independent, and to that extent we cannot conduct our own case. We must depend to some degree on what willingness, and what resolution others choose to display in making our case for us. But secondly, the policy we follow is one of progress based on merit, not race, and we are determined that, despite present imperfections and in the course of time, merit and merit alone will be the criterion in the public life of the Federation. This policy is extremely hard to gainsay and we present a problem to the pan-Africanists. In the short term they may be able to get away with their promises of what the political kingdom will bring; but in the long term – and it is already upon some of them – lowered standards, corruption and the terrible oppression which the African has shown he can wreak upon the African bring disillusionment, and only the ignorant and cynical can now go on claiming that the Pan-Africanists have a better, more honest way of life to offer than we have. This is the truth, but Pan-Africanism goes on with scant regard for truth. Nevertheless, one result has been to force them time and again to show their true colours as pure racialists. Another result has, of course, been that we are now being pressed to go faster in our progress towards multi-racialism, to lower standards and to bring the African into the public life of our country at an ever-increasing pace without regard to his ability; for this is the only way our opponents can get around the logic and the morality of the stand we have taken. Despite the evidence of progress of eight years, there for all to see; never mind how much or little money there is to spend on schools, how long it takes to train an engineer or a doctor; never mind the backwardness of the vast majority of our African people and especially their womenfolk, a backwardness which is much greater than in South Africa or the West Coast of the Continent; where civilisation came so much earlier than in our case; never mind that political uncertainty, which has been forced upon us in Central Africa, itself gravely retards development and discourages investment, from which alone we can derive the resources we need for African advancement; the demand is that we go faster. Those who direct Pan-Africanism deliberately disregard all the essentials of real progress, and, again in the short term, they can afford to do so, because it is unfortunately true that to many ordinary Africans these are not recognised as essential. They will accept that it takes a year or so to train as a mechanic, but they cannot see why it should take years of experience to become a competent civil servant, or more than six weeks to learn to be a diplomat – and the qualifications they seem to require of a politician or a Prime Minister are strange, to say the least of them. May I assure you that I speak of these people in no unkindly way, but with an intense awareness of how great our task still is in the Federation, and how grave an injustice the Pan-African leaders are inflicting upon their own people. In the campaign against the Federation the old standbys – the Africa Bureau, the long-haired gentry and the like – are as enthusiastic as ever, and about as effective; but the Pan-Africanists have developed other weapons to a considerable extent in the past eighteen months. The United Nations Organisation, with 110 members and a majority of Afro-Asian members, is today in the hands of a highly organised clique whenever Pan-African issues come under consideration – which, they see to it, is often – and that clique is now trying to convert the force of words and propaganda into a physical power which they want to see intervene in the affairs of countries such as ours. The Charter of the United Nations Organisation does not provide for this, and although the lessons of the Congo fiasco are beginning to be appreciated by the more responsible nations – and by those who have had to pay for it – this trend must be watched. Its implications are wide and the threat it contains is by no means confined to us in Africa. Thus in U.N.O. the Federation is already on trial, by those, I may say, whose qualifications to sit in judgement scarcely bear scrutiny. I used these figures in Parliament four months ago; I make no apology for using them again. Of the 6l member States which first voted to bring Southern Rhodesia into issue, 22 are dictatorships, 23 do not even honour their subscriptions to U.N.O. and two tolerate slavery in this year of grace. Within the councils of the Commonwealth itself the principle that Commonwealth countries do not interfere with each others’ internal affairs or politics was abandoned at the last meeting South Africa attended; and the old and valuable concept of a Cabinet of Commonwealth Heads of State has gone by the board. Press Conferences and handouts of set speeches are now the order, and this year’s Conference made it clear that these meetings have now taken on certain characteristics which the United Nations Organisation has developed in recent years. In all this there is a real threat to the future of the Commonwealth, association and to the ability of its leaders to meet to discuss matters of common concern. Which of its present members would like to see what happened to South Africa happen to it? Yet which of its members is perfect? The affairs of Ghana are too well known to need recounting, but there is scarcely a Commonwealth country without an embarrassing skeleton in its cupboard. Two have restrictive immigration policies which take account of colour. In one a third of the population is deprived of the vote on grounds of race. Sheer hypocrisy attaches to the external policy of at least one other. The Federation’s fault is not that it does not subscribe to the Commonwealth ideal; it is that it stands in the path of pan-Africanist ambition, and because the meetings of the Commonwealth Heads of State are in danger of becoming yet another forum for its spokesmen, it may well be that attempts will shortly be made to exclude us from these conferences. This is the general trend of Pan-Africanism as it affects us. I want now to turn to more specific issues. Our problem in the Federation resolves itself into several parts. Firstly we have to resist this force of Pan-Africanism – no easy task, because, as I have said, it is purely racialist and out to sweep .the white man from control of any part of Africa, it is interested in neither logic nor standards of civilisation and it is prepared to go for power whatever the cost to the ordinary man. It is heavily backed from outside the borders of our country. It has harnessed the forces of propaganda to a remarkable degree and it has enjoyed some 10 years of fashion and sympathy, especially with those who have wanted a plausible excuse for getting out of their commitments on this Continent. It is largely a force of words, but it has never hesitated to whip its followers into physical violence and to flout the law, and it has made the weapon of intimidation peculiarly its own. A daunting force to some, but to my mind not to be regarded as irresistible. To meet this force we in the Federation have had to do two things; provide a way of life and government which will, in the long term if not in the short, be preferred by the mass of Africans to the specious promises of the pan-Africanists; and buy time to do this by building up forces capable of maintaining law and order within our borders, and of meeting any possible threat from without. We are doing the former and have done the latter, though it has been costly and a burden on a developing country, and I myself have resented that so much money and effort has had to be diverted to defence from progress and advancement. Secondly, our efforts to remove discrimination of one race against another have had to be a genuine, but at the same time not such as to cause social upheaval or so great a degree of resentment that the very purpose of those efforts would be defeated. We have never accepted the inevitability of lower standards, nor with the experience of the past eight years behind us, do we accept it now. The African must come up, for his sake as much as for ours, and it can be done, given time. Moreover, we see nothing wrong or out of the proportions set by history, in requiring reasonable time for prejudices to go and social injustices to be removed. They cannot be wished away, which is a fact which must be faced, nor can they go by revolution without being replaced by worse. On the other hand, anyone who knew the Federation in 1953, and who makes an honest comparison between those times and today, cannot fail to be astounded at the degree to which discrimination and prejudice have gone in eight short years; nor can he fail to recognise the anxiety so many feel lest the actions of extremists retard or set back this orderly progress, as they can so easily do. Thirdly, there is the task of teaching and training and although in this we have already achieved considerable success, our great problem is that once their meaning and value are appreciated the demand for learning, skill and the opportunity to use them becomes almost insatiable. Now, Mr. Chairman, it is not generally realised that despite everything, the economy of the Federation is strong and our resources are growing, nor is it generally realised how much we have managed to do in eight years, the life of our country. 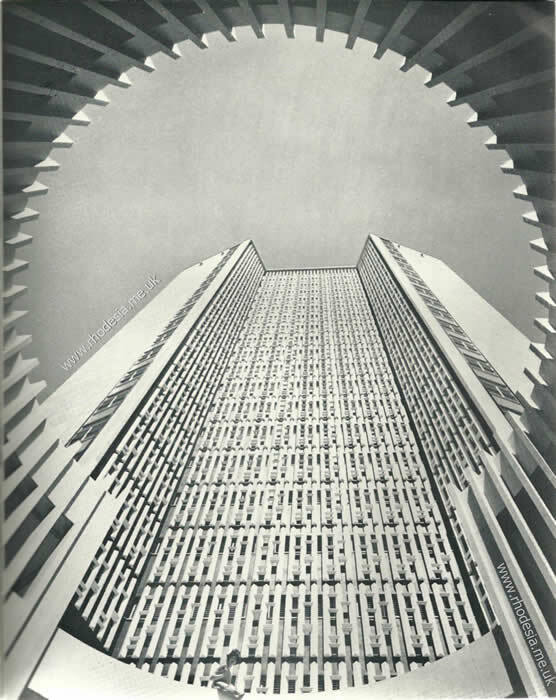 In 1961 there was a record favourable Balance of Trade of nearly £59 million. This year it is likely to be even better. The Gross Domestic Product, at factor cost, rose from £362.2 millions in 1954 to £561.4 millions in 1961. The total available finance from both domestic and external sources was £85.0 millions in 1954; it was £118.3 millions in 1961. African wages have risen since Federation by 39%, expenditure on Health has been more than doubled, from £4.247 millions in 1954 to over £8,6 millions in the current year and the number of hospital beds has been increased from 16,800 in 1955 to some 27,500 today. 85% of black African children of lower primary school age, that is 7 to 15 years of age, are today in school in Southern Rhodesia – that is one in five of the whole population. In the Federation as a whole the proportion is one in seven, which cannot be bettered by any other country in Africa – except South Africa. But this strength and growth are not enough to provide, as we must for the foreseeable future, still more schools, hospitals, housing and other essential amenities to millions who cannot pay for them, and who can still contribute only little to the real income of the country. And it is tragic that every act of violence, every political outcry of the extremist, not only revives prejudice but holds back our progress still further, and keeps more industrialists and more investors in doubt as to our soundness as a repository for their money. That may sound obvious, Ladies and Gentlemen, but it is one of the greatest problems we face, because the Federation, partly controlled as it is from Whitehall, is the happy hunting ground of the extremist and the political agitator. If I may, I will tell you why this is so. Like all the Metropolitan powers Great Britain has decided to get out of her Colonial responsibilities as speedily as possible. There is nothing wrong in the decision as such; it all depends on how it is carried out, and what is left behind. So far as Great Britain was concerned, I had always understood, from my earlier discussions with British Ministers, that the intention was to advance all Britain’s colonial dependencies to independence, as soon as they were capable of carrying the responsibilities that went with such a status. On this issue I believe there was very little difference between the policies of the Socialist and Tory Governments; but when Britain came to implement her decision some years ago, the course she decided to follow was reflected in the “Winds of Change” speech, which is well enough known to you to need no further reference. Her going was pinned to the fashionable word “freedom” and her determination to persevere in this disengagement from colonial responsibility has been proved by its continuance, despite the lesson of Ghana, the invidious position to which Kenya has been brought and the extent to which the extremists have been pandered in my own country. Understandably these people, both within the Federation and elsewhere, were quick to take advantage of what the change of wind meant, and for a while every little demagogue had his day. Indeed it was not unknown for a demagogue to be built up where none existed, in order to find someone to hand over power to. So far as the Federation has been concerned, Britain’s decision to pull out came early in the life of the country and represented in several ways the complete reversal of a policy which had led to the inception of the Federation only a short while before. It is all too often lost sight of that the concept of Federation was Britain’s and that both the British Tory and the Labour Parties when in Government played leading parts in its foundation, and in enshrining partnership and the concept of multi-racialism in its Constitution. So far was British official thought at the time from accepting the inevitability of African racialist government that a new State was created, the very purpose of which was to keep this sort of government, with its extremist manifestations, from Central Africa. As I have said, the African extremists were quick to take advantage of what the change of wind meant in Britain and as quick to take advantage of the personalities installed in the capitals of the Northern Territories. And the result today in Nyasaland is the entrenchment of a single party in a de facto government, hostile to Federation, a government which had its origins in the character of the Nyasaland Administration in the first years of Federation, as well as in a liberal use of the weapons of rioting and intimidation in its pursuit of its political goals. There were, as there are now, a mere handful of Europeans in Nyasaland to influence the course of events. Law and Order and, as I have said; everything to do with day-to-day life of the African is Territorial under the constitutional division of power; and Nyasaland is still a protectorate of Great Britain. Therefore, though we foresaw and resisted the course of events, there was little the Federal Government could do about them, provided the Federal Constitution was not transgressed, which it was not. In Northern Rhodesia the pattern was much the same, while in Southern Rhodesia, the oldest and the most developed of the three territories of the Federation, extreme African nationalism has also shown itself; but it was not until recently that it took the form of the movements in the North, and received the same measure of support from abroad. In all three Territories the African nationalist movements have been supported from abroad, but the branches in Northern Rhodesia and Nyasaland have found special sympathy in some circles in Britain, have close ties to Accra and Cairo and the unstinted backing of certain Afro-Asian members in Manhattan. In all three Territories the game of violence and threats of violence, coupled with political demands, has been played, but, of course, it has been particularly effective in the North where it can be almost constitutionally played – if that is not a paradox – by setting London against Salisbury, Lusaka and Zomba. And I can assure you that there have been those in London who have joined in this game with zest, having every sympathy for the cause of Pan-Africanism and being every bit as willing to blind themselves to the evils of its methods. the British public have found it extremely unpalatable to see their own kith and kin being treated as they have been treated in some of the independent African States. Also, of course, what has happened in Kenya has been a bitter pill for many British people with relatives and connections in Kenya; and what is about to happen will be even harder to swallow. But translating this into official thinking and above all action is another matter. The most one can say is that certain of the British leaders have become disillusioned. But a factor which I believe has contributed materially to the difficulties of the Pan-African leaders – and this I refer to with some pride – has been the determination of so many Rhodesians not to let our country be a second Congo, a second Ghana, or a second Kenya. These Rhodesians have satisfied themselves that our policy is not repressive, though it will take time to mature. They have satisfied themselves that the unseemly scramble out of Africa has brought bad, not good, and suffering, not benefit, to the average African. They have satisfied themselves that almost the whole world has fallen for the magic of words, that fine phrases and propaganda have cloaked something which is essentially evil in fact and result. Therefore they have decided that in the interests of the African, as much as the European, we must stand firm in the Federation, although they are prepared to open up every opportunity for reasonable discussion of our problems. Against this background constitutional negotiations are in progress. In Southern Rhodesia, Sir Edgar Whitehead, who has been putting the facts about his country before the United Nations, has just introduced a new Constitution for the Territory and will shortly seek the endorsement of the electorate of the further progressive measure which it represents – progressive but real, because the new Constitution, though it will bring Africans into the Southern Rhodesian Parliament, still demands that a man shall qualify to play a part in public life. And have no illusions about it, Southern Rhodesia will not be forced from this requirement, and sees no reason why it should be. A fact all too often overlooked, incidentally, is that since 1924 there has been nothing whatsoever to debar an African from entering Parliament or holding the highest office in the land. In Nyasaland political leaders are in London negotiating another step in the Territory’s constitutional progress. Extravagant demands have been made by the governing party for the future; but though this party may not like it, the fact is that Britain will largely decide what changes are to be made. And it is also true that the facts of economic life are creeping up on Nyasaland and that an annual subsidy of nearly £5 million from the Federal Government alone is not something which can be ignored by a country as poor as Nyasaland. As to Northern Rhodesia, I will say this: I believe the outcome of the election just past will have an important influence on the minds of the British Cabinet. The Macleod constitution, under which a General Election has just taken place, always seemed at best designed to achieve a stalemate and at worst to be charged with bias; and though it is virtually certain that my Party has emerged as the majority Party, and substantial vote given the African National Congress has cut U.N.I.P. down to size, even now we must await the outcome of the bye-elections on the frustrated Middle Roll before Whitehall will face the issue – which is that the extremists have been rejected in terms of a constitution designed by Whitehall itself. Meanwhile I have little doubt that all the old arguments about thousands of men and women being deprived of a voice will now be revived. All the old methods of intimidation – of the individuals in Northern Rhodesia and of authority in Whitehall – will be used once more. Nothing will be said of responsibility re-entrenched, or of all the many thousands of Africans who have shown themselves glad to accept it as Northern Rhodesia’s way of life, and bitterly opposed to the men of violence. May I, at this stage, tell you something of what intimidation means, because the Africans I have just referred to, in openly taking a stand against the extremists, have had to face one of the vilest and most pernicious weapons the history of political life has ever thrown up, and have shown courage which should be an example to us all. The story of intimidation in the Federation is a long one and examples of what has been done are all too numerous and unpleasant. I will give you a few. On December 7th, 1961, the house of the Secretary of the Highfield Branch of my Party was attacked with petrol bombs, and in Southern Rhodesia in 1962 there were 33 such petrol bomb attacks mainly against Africans and their homes. On September l6th 1962, an African was beaten up because he had gone to a boxing match instead of attending a particular political Party’s meeting. He died. Last month an African police Reservist in Southern Rhodesia was stoned, beaten up, soaked with petrol and burnt to death – because he was a police reservist. Yet Sir Edgar Whitehead has 7500 African police reservists – all volunteers. In Northern Rhodesia the petrol bomb is again a common weapon. In August 1961, the dormitory of a girl’s school at Chilube Island was set on fire while there were 59 girls inside. In April, 1962, a young African was beaten to death during a political rally in Bancroft. Only last Thursday an African was stoned to death in Kitwe and three men with him were seriously injured – by political rivals; and I could go on at length; I could tell you of the staff of a mission station in Nyasaland who were forced to leave following threats of death from Africans; I could tell you of the persistent threats used against African members of the Federal Parliament; but I think, Mr. Chairman, I have made my point, that the many thousands of Africans who have come out on the side of moderation in the Federation really believe in it themselves, and prove this in what they go through. Mr. Chairman, we must now wait and see what Whitehall will do; but in my view Whitehall has now excuse enough, and excuse acceptable in the minds of thinking people, to stand-firm at last, and translate, that firmness into support for the genuine multi-racial concept which has been endorsed in Northern Rhodesia just as it is entrenched in the Federal Constitution as a whole. If they don’t they must remember that we are moderates, but moderates are not weak people. We will still stand firm but now we must go on to demand an end to this uncertainty. We see no reason why these affairs should not be settled speedily, but we have reason enough to know that it is only when these constitutional issues are settled that there can be a renewal of progress and development in the economy of the country, and in the advancement of our backward people. We also believe it is time for our responsibility to be acknowledged by a sufficient measure of independence in the Federal field to free us from the hinderances we have had up to now. The issues cannot in my view be delayed more than a few months longer. But let me say this. Even then we do not expect to be free from the pressures of the pan-Africanists and those who stand behind them. These will go on for some time to come; yet I am convinced that if we – and by this I mean South Africa, the Federation and our neighbours to the East and West – can survive this present surge of that movement for the next three to five years, then we will have saved Southern Africa from its evil consequences. This is by no means an empty statement or an idle boast. I have already said that Pan-Africanism is very largely a force of words and propaganda and I want to give all the emphasis at my command to the truth of that statement and to its implications. Pan-Africanism has neither budget nor army, except what it can extract from the United Nations by dint of propaganda. This is known, but what is not widely recognised is that it is a force of unity on only a very few issues, and there is no real cement which holds the Pan-African movement together other than the common desire to rid Africa of the white man and of everything that the white man stands for. How little identity of real interest there is amongst these Pan-Africanists is not hard to see. It is reflected in the sharp division there is between the Casablanca and Monrovia groups, as clearly as in the bitter and explosive rivalry that exists between the major political parties in Kenya, which have in fact emerged almost exactly on a tribal basis. Even the logic of a close economic association between Uganda, Kenya and Tanganyika has not come near to overcoming the nationalism of the political leaders of each Territory, and what identity of interest – commercial, political, defensive or ethnic – is there between Nyasaland and Nigeria? Far from real unity, there is every sign today of increasing rivalry between the newly independent African states – rivalry for leadership in the dream of some Pan-African empire and also for the handouts of dollars and pounds which have become a feature of recent years. As for leadership in this new imperial effort, I see, as yet, no leader on the African scene with the standing or the backing needed to make him the new Napoleon of this Continent. The truth is, of course, the people of Africa are not homogeneous nor does the geography of the Continent lend itself to close ties between the nations except on a regional basis; and so many years must pass before the influence of tribalism ceases to be acutely felt, that within that time we can with justification believe that the force of Pan-Africanism as we know it today will have been spent, and something far better will have taken its place. But we must have no illusions. There can be no compromise with Pan-Africanism in that time. Once you try to compromise you go under, and this audience tonight will be aware that there have been attempts – some by individuals, some by businessmen, some by governments – to compromise, which have resulted in only degradation and ultimate failure. Far from these being the farsighted wisdom of impartial men, they are direct aid and comfort to those who will in the end accept you or do business with you only on tolerance and on their distasteful terms. And, for example, every investment withheld from the moderates today lessens their ability to withstand extremism now and in the future; and history has shown how quick and expert the Pan-Africanists are to take advantage of those, whether they be individuals, firms or governments, who seek to compromise and hope to get the best of both worlds. In practical terms, you cannot satisfy the crocodile by feeding others to it. Finally, let me say that in any case I see no reason to compromise. Here in Southern Africa Pan-Africanism and its evils are not regarded as irresistible, and they are being contained. Nor do I see any reason why, in my country, we should lose heart. Whatever may have been said, the Federation as it was created in 1953 by Act of the United Kingdom Parliament, and with the consent of Her Majesty the Queen, is intact and is strong, and our troubles are certainly no worse than those of many other countries – we stand in no greater danger than Austria does, or Greece, and our history has certainly not been as turbulent or tragic as that of Poland or Czechoslovakia. I myself prefer to look to the forces that are working for good and I find them strong in my country. Many thousands of Africans, of whom one hears little, are coming forward on the road of advancement and in support of moderation. Many thousands are backing our endeavours to create a new nationalism in the Federation – for we are not afraid of that word, although we are doing all we can to make the ordinary man and woman unafraid of what it has meant in the past, in terms of the weapons of Pan-Africanism, the weapons of intimidation and thuggery. Instead we are seeking to give it its proper meaning once again, which is pride in nationhood and, in our case, a community working together without sense of race. Nor in the broader field of the Commonwealth’s future am I afraid of what Britain’s entry into the Common Market will mean, though I am keenly aware of the difficulties which must inevitably flow from it. But a third world force is being created, for that is what the Common Market is to mean, and I acknowledge that Britain must participate in this, and lead if she can. Yet I see it as essential for Britain, who will be only one voice in seven in the European Community, to have the Commonwealth in some substantial association with her in the future. The Federation’s stand on this important issue is to support Britain in her negotiations with “The Six” and her endeavours to find ways in which Britain’s entry can carry the strength and support of the Commonwealth into her association with the European Community, while at the same time bring benefit to the Commonwealth as well. A prosperous Britain and a prosperous Europe can only benefit the developing countries with which they are associated and by doing so bring further prosperity to the community of Europe; but to my mind even this does not go far enough because, if not for the sake of the developing countries themselves, then in the interests of the West the real progress of these young countries must be speeded up. There is far too much poverty about for safety and stability. We in the Federation do not believe that development can be substantial if it is based largely on charity and hand-outs. These have their value, especially in the fields of education and research and in the tackling of special but expensive projects; but fundamentally development will go forward and be sound only if it arises from the capacity, potential and strength of the country itself. Even after so many years the fashion of political freedom still obscures this fundamental factor, and in that time millions of pounds and dollars have gone down the drain. I have, therefore, appealed for a new look at the economies of the younger countries, and it is my belief that because so many of them are primary producers, the greatest assistance that could be given them at this time, and the best safeguard of their allegiance to the West, could be given through the development of such factors as international commodity agreements. Not only would they be able to find development funds from their own resources and avoid the begging that goes on today, but their planning could be both realistic and long-term. In my view such agreements would be of the greatest benefit to the future of the younger countries, and to the progress of their backward people; and nothing could identify them more effectively with, the interests of the West. Mr. President, I must ask you to let me end on a personal note. I have so often in recent times been presented in a blood-stained image, as an oppresser and a reactionary. Time and again it has been said that my troops or my police have shot down innocent Africans in order to maintain the policy of the Government I lead. How little truth there is in this is shown in the fact that my Government has no police force, not one single man, and in the fact that the federal Government’s Army and Air Force have never fired a single shot during any civil disturbance, except at the request and under the direction of the [British appointed] Territorial Governor concerned. This is the constitutional position in the Federation and this is the fact. Yet these accusations go on. They do not worry me unduly because of whence they come; but I do want to say this to thinking people, and people of good will. The record of what I have said and done is there for all to see. I have constantly urged the abandonment of any concept of race in the assessment of a man’s worth or his rights, and as consistently have I tried to show my countrymen that there is nothing to fear in this, provided only that a man shall be capable of earning what he gets, and that in public life the normal demands of civilisation, above all, law and order, shall be met. My greatest reward has been to see these precepts followed by so many in my country, and this, with their steadfastness, is my reassurance for the future.